Maglev—short for magnetic levitation—trains can trace their roots to technology pioneered at Brookhaven National Laboratory. James Powell and Gordon Danby of Brookhaven received the first patent for a magnetically levitated train design in the late 1960s. The idea came to Powell as he sat in a traffic jam, thinking that there must be a better way to travel on land than cars or traditional trains. He dreamed up the idea of using superconducting magnets to levitate a train car. Superconducting magnets are electromagnets that are cooled to extreme temperatures during use, which dramatically increases the power of the magnetic field. "A maglev train car is just a box with magnets on the four corners," says Jesse Powell, the son of the maglev inventor, who now works with his father. It's a bit more complex than that, but the concept is simple. 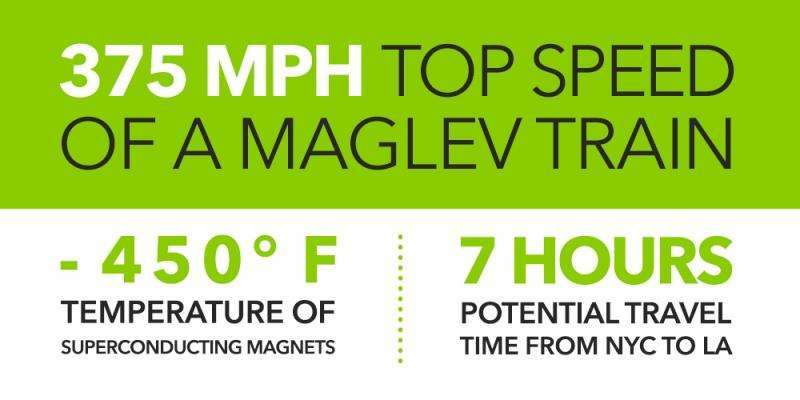 The magnets employed are superconducting, which means that when they are cooled to less than 450 degrees Fahrenheit below zero, they can generate magnetic fields up to 10 times stronger than ordinary electromagnets, enough to suspend and propel a train. The third set of loops is a propulsion system run by alternating current power. Here, both magnetic attraction and repulsion are used to move the train car along the guideway. Imagine the box with four magnets—one on each corner. The front corners have magnets with north poles facing out, and the back corners have magnets with south poles outward. Electrifying the propulsion loops generates magnetic fields that both pull the train forward from the front and push it forward from behind. Another big benefit is safety. Maglev trains are "driven" by the powered guideway. Any two trains traveling the same route cannot catch up and crash into one another because they're all being powered to move at the same speed. Similarly, traditional train derailments that occur because of cornering too quickly can't happen with maglev. 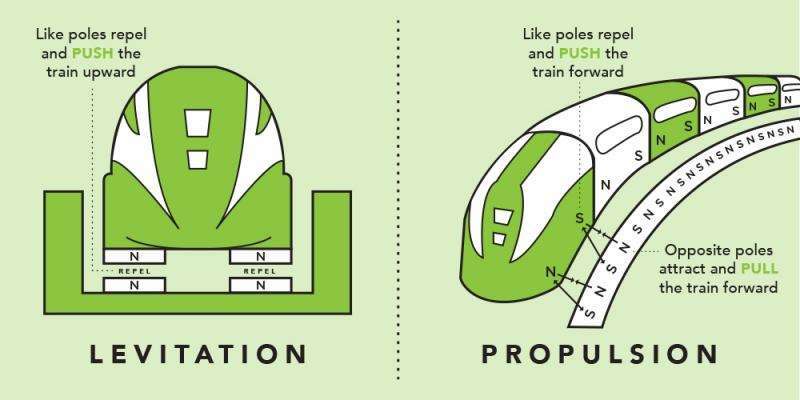 The further a maglev train gets from its normal position between the guideway walls, the stronger the magnetic force pushing it back into place becomes. This core feature is what's most exciting to Jesse Powell. "With maglev, there is no driver. The vehicles have to move where the network sends them. That's basic physics. So now that we have computer algorithms for routing things very efficiently, we could change the scheduling of the entire network on the fly. It leads to a much more flexible transportation system in the future," he said. While this exciting technology isn't deployed in the United States today, if Powell and his team get their way, you could someday be floating your way to your next destination.